Throughout the years, millions of people have seen chiropractors who have successfully helped them eliminate pain and improve their health. 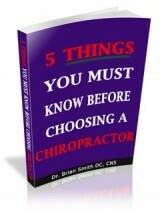 However, many people have never seen a chiropractor and are confused (and sometimes even afraid) about what to look for when choosing a chiropractor. Chiropractors are licensed in all 50 states. In many states chiropractors have been acknowledged with “physician status”. Where I practice, in New Jersey, chiropractors are designated as “chiropractic physicians”. We need to take continuing education to maintain our licenses. We have to carry malpractice insurance (although it costs significantly less than a medical doctor’s, since statistically chiropractic is safer than health care approaches that rely on drugs and surgery). Chiropractic school is considered a four year post-graduate academic program. Students graduate with a “Doctor of Chiropractic” degree. Just like medical school, admission to a chiropractic school requires undergraduate courses in the sciences such as biology, chemistry, organic chemistry, biochemistry and physics. I myself graduated from Rutgers University with a bachelor’s degree in biochemistry and worked as a research chemist before beginning my post-graduate education. While I said that “Chiropractors are REAL Doctors”, I did not say “chiropractors are medical doctors”. We are not. We cannot prescribe medications or perform surgery. Those things are not within our scope of practice. The basic science curriculum in chiropractic school and medical school are very similar, but when medical students start studying pharmacology, chiropractic students begin studying chiropractic adjusting techniques. If you would like a copy of the full ebook this post was based on, email me at drsmith@southernoceanchiro.com and I’ll be happy to send it to you. It's surprising how little everyday people know about chiropractors and how much that effects their decision to get in touch with one if they need the help. However, the article makes a lot of good points in enforcing the truth that chiropractors are doctors that can be trusted with your health. I in particular didn't know that chiropractors do a four year post-graduate program just like any other kind of doctor. It was really informative how you mentioned that you talked about your degree and how you need to study and train to become a chiropractor. To be honest, I didn't know that chiropractors have to do that as well. I guess there are a lot of things that I don't know. It's good that I came across this article because I need someone to help me with my spinal alignment. Apparently, my job that requires constant moving and lifting caused it to lose alignment. Maybe I'll seek the help of a chiropractor near me for this one. Thank you! I really like how you said that a chiropractor should have insurance and be educated. It's nice that you said that they should also have a degree. My husband is looking into chiropractors to fix his back pain. Feel free to give us a call. We're here to help!